F.U.K.T – Danish live Drum’n’Bass sensation! Since 2002 the Drum’n’Bass live act F.U.K.T have moved from a rather peripheral existence in the Danish electronic music scene to a top spot of the newcomers of today. They have gone far beyond the borders that traditionally ties up a scene like Drum’n’Bass in Denmark, and their live performance is without a doubt unique, since they interpret the genre solely live – this means no sequencers, no backtracks and no drum loops. A mission, that in it self is impressive since Drum’n’Bass especially is characterised by high tempo and complex drum syncopated soundscapes. In 2004 and 2005 F.U.K.T have made a series of remarkable live performances, which captures the audience in a rarely seen way. Most noteworthy were last years concert in front of 5000 spectators at the Roskilde Festival in Denmark, from which the band afterwards got impressively five star reviews in several papers and magazines. 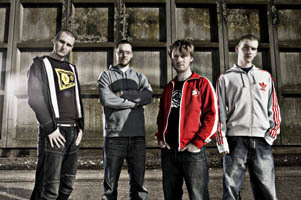 Even in England where Drum’n’Bass traditionally has its strong base, F.U.K.T have made big impressions and have already gotten airplay on radio stations like BBC 1Xtra, Kiss100FM and RinseFM. Now, F.U.K.T have on top of that landed a record deal with Danish label Murena Records, which previously has proven to be a solid label for new coming acts of electronic music. Their album release is scheduled to April 2006, and will surely be one of the most interesting live electronic releases coming out of Denmark this year. The first single release is about to hit the streets. Including a remix by two of Englands finest up front producers, RoughCut & L Double, this should hopefully increase the knowledge of the band to a broader range of people, and thereby proving that F.U.K.T is one band to look out for in the coming months of 2006. F.U.K.T are Lars Halvorsen on bass, Anders Meinhardt on drums, Casper Meinhardt on keyboard and Rune Rawson on sampler.